President Duterte once joked that he uses marijuana to keep up with his hectic schedule. “It’s a killing activity, and I think that at my age—ako hindi masyado, kasi nagma-marijuana ako eh, para magising. Sa iba, hindi na kaya,” the 73-year old said before the members of Malacanang press corps back in December. Presidential Spokesperson Salvador Panelo was quick to clean up after this PR nightmare, while critics and lobbyists of the legalization of marijuana for medical use called it insensitive. Although, Panelo also added that Duterte is for its legalization. And today, it is one step closer to becoming a reality as the House of Representatives approved in a final reading House Bill 6517, a bill seeking to legalize and regulate the use of medical cannabis (marijuana) and expand research into its medicinal properties. Authored by Isabela 1st District Rep. Rodito T. Albano III, the bill was filed in 2014 but has since faced strong opposition particularly those coming from medical practitioners who insists that there is insufficient evidence to back therapeutic claims. 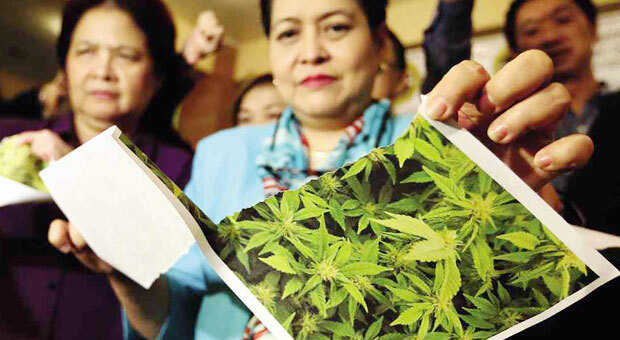 Under the bill which had 163 affirmative and five negative votes, marijuana can be prescribed by Philippine Drug Enforcement Agency-accredited doctors to patients with debilitating medical conditions qualified by the Department of Health. Patients with IDs can acquire marijuana from proposed Medical Cannabis Compassionate Centers which will be put up all over the country. The measure also authorizes institutions like the University of the Philippines (UP) National Institute of Health, the Health Sciences Center of the UP System, the Philippine Institute of Traditional and Alternative Health Care among others to conduct research on its use. In an interview, Rep. Albano, however, cleared that the bill won’t decriminalize the use of cannabis or marijuana for recreational use, neither would it allow smoking. Its passage as a law will not mean that marijuana will be available for purchase over the counter either. Medicinal marijuana in the Philippines: Is this finally happening?